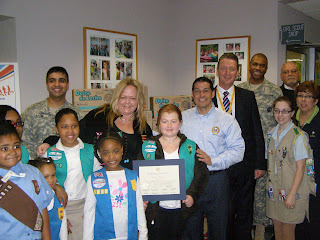 March 30th was a big WIN-WIN day for the Girl Scouts and our military personnel. 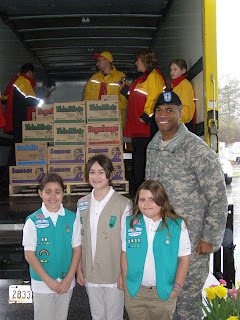 For the fourth year, Girl Scouts of Nassau County is blessed to partner with DHL Express Global to send Girl Scout Cookies® -- “taste of home” -- to our military personnel serving in Iraq, Afghanistan and the military hospitals in Germany. This year, some of our Cookies will be going to wounded warriors at the Walter Reed Army Hospital in Washington, DC. So far this year, Girl Scouts have sold more than 45K boxes of Girl Scout Cookies® to be shared with our military personnel. It is a just a small way that we can give back to those who are making the sacrifice of service in the all-volunteer military of this era. Since the beginning of the Girl Scouts in 1912, we have pledged to serve God and our country, and to make the world a better place. During other wars Girl Scouts rolled bandages, collected scrap metal, planted Victory Gardens, sent cards and did whatever they could to support the soldiers and their families still at home. None of this would be possible without our partnership with DHL Express Global. Since 2006, DHL has shipped over 100K boxes of Girl Scout Cookies® to the military. If Girl Scouts had to pay to ship even one box of Cookies to the military, we just couldn’t do it. As much as we might want to help, we have a fiduciary responsibility to spend our money on the Girl Scouts of Nassau County, not on shipping Cookies to foreign lands. Because DHL Express Global is a company that gives and gives, we are able to support our military and our Girls. 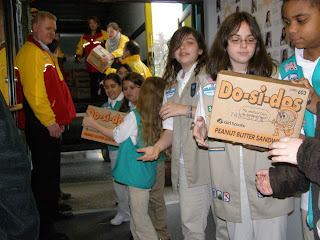 After paying the baker, every dollar spent on Operation Cookie stays right here with the Girls Scouts of Nassau County. The money goes into Troop treasuries, and it supports camping, program and training for adult volunteers. It also helps to pay for girls who need financial assistance. Giving is part of DHL’s corporate culture, and we are so fortunate to be part of their giving family. They are supporting our military men and women who are in harm’s way, while they are giving right back to our community through Girl Scouts of Nassau County. And today was quite a party. GSNC Board Member Cathy O’Reilly, part of the leadership team at DHL’s JFK operations, was here with her mom, brother and nieces. Steve Meadows, Director of DHL’s Gateway Operations, was here too, along with his wife and daughter and at least a dozen more crew from DHL. We welcomed Army Sergeant Mitchell and Army Second Lieutentant Kazmis, both who are currently on active duty and who have served multiple tours in the Middle East in recent years. 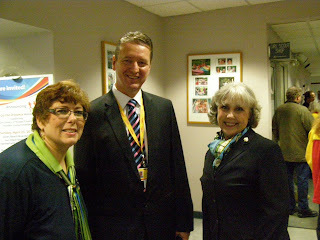 Jim Adelis, President of Adelis International Security, a good friend of the military and of Girl Scouts, was here. He presented GSNC with a check for $1,500 for more Cookies to be sent to our soldiers, on behalf of his organization, American Citizens for Soldiers in Service. Jim was honored by Girl Scouts of Nassau County last year in recognition of his leadership in the Trees for Troops project that, in conjunction with DHL, sends live Christmas Trees, along with other seasonal cheer and Menorahs to our military personnel serving in war zones. Robot Performance Award: the team whose robot achieves the highest score from a single round on the competition field. Project: Research Quality, Innovative Solution and Creative Presentation: FLL presents the project awards to the teams whose quality research, innovative solutions and creative presentation best reflect an in-depth understanding of the various scientific disciplines and issues involved with the Challenge project. There is only one award given for each of the three categories. Gracious Professionalism: Gracious Professionalism is a way of doing things that encourages high quality work, emphasizes the value of others, and respects individuals and the community. This team demonstrated that their members can learn and compete, but still treat one another with respect and kindness in the process. Only one award is given. While the fifth Girl Scout team, LEGOTRONETTES (Michelle Iannuzzo, Paul Iannuzzo, Jim Colwell with girls from Hicksville meeting at Lee Avenue) that competed did not win one of the special awards, we are very proud of their performance as well. The team was in sixth place in the performance part of the tournament. They cheered on the other teams and, as one of our newer teams, learned a lot and will come back ready for action next year! A sixth team, X Factor (Paula Davy and Judaea Yarde Lane with girls from Westbury), competed in the qualifier tournament earlier in the month, and we commend them for their teamwork and effort – and know they’ll come back next year with new ideas for improving their robot and presentations. And we are sure our four other teams, who didn’t feel quite ready to enter the tournaments this year, will be ready for action next year! We are so very thankful for the enthusiasm of the girls, the volunteers who served as mentors and coaches for the teams and the support from our parents! Most of our coaches also lead ongoing Girl Scout Troops, or help with their daughter’s troop in another way, and have received support from many staff throughout their volunteer experience. So, a pat on the back for all who touch the lives of our girls, volunteers and parents! To see more photos, be sure to visit our Flickr page! Click Here!